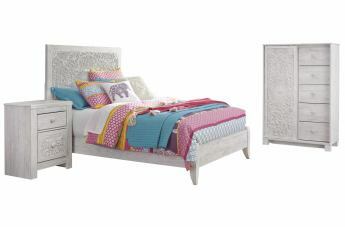 This Paxberry Bedroom collection features white wash replicated worn through paint with authentic touch. Paxberry cases feature dainty and delicate hardware in a worn through painted look. Drawer interiors are lined with a faux linen laminate for a clean, finished look.